Ex-Park Orchards and Eastern Under-18s. The younger brother of Jason made his debut early in 2004 and although given limited game time in some of his initial appearances he showed promise and didn’t take a backward step. He missed the last nine weeks with a shoulder injury. That shoulder problem continued to be a limiting factor over the next two years. 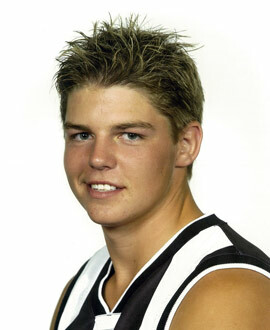 De-listed by Collingwood along with his brother Jason, he was picked up by Carlton in the pre-season draft. He started well at his new club but injured his shoulder after six games. In 2008 he was an honest worker who played all but two games, and re-established himself at AFL level. In 2009 he only had 10 games and was delisted before being picked up by Port in the rookie draft.